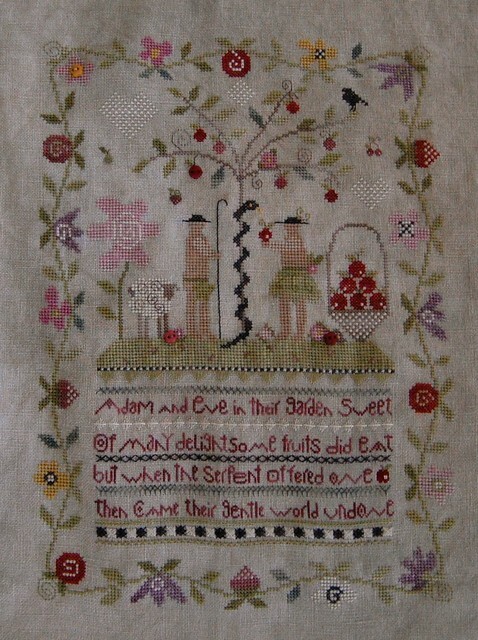 Nicole's Needlework: Eve's Garden Finished! I had so much fun stitching this sampler. After I finished the border and the section of grass, it really went quickly. My congratulations!! I like this design very much! It's so bright and fun! The colors are gorgeous. Love the serpent! Beautiful!!! It came out so gorgeously! I so need to stitch this. A really lovely finish Nicole. That is a beauty...I love the border. May have to add to my Wish List. Very sweet. Well done! Love the colors in this one. Nice! Gorgeous Nicole, just gorgeous!! I need to start on mine soon, seeing yours and Terri's makes me drool, lol! Love it! And you finished it in record time too! I have the snake, tree and top border section stitched-the colors are fun in this one. Outstanding!~~ I love this piece!!! 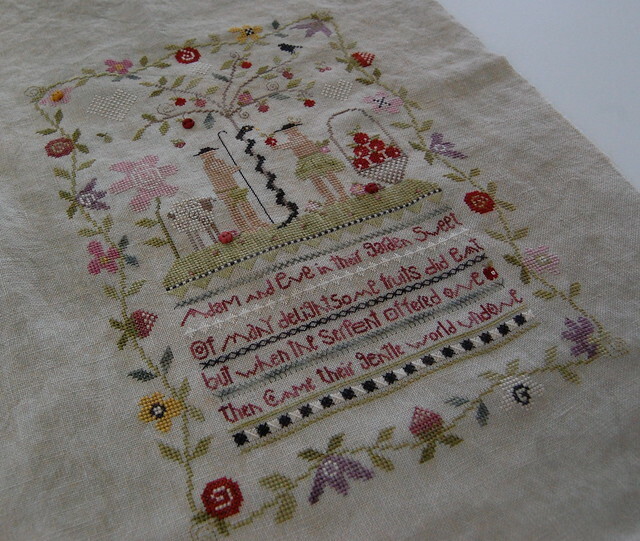 Adorable sampler, so sweet and delicate! Congratulations Nicole. Such a beautiful piece. It's so pretty Nicole, congrats on the finish :-). That was fast. It's so Lovely & pretty. Love the colors. Do you think you will finish it as a pillow or frame it? This is really very pretty. Great job! Fantastic finish, Nicole!! Great job! Love the new blog look, too! So very cute, Nicole. I love it !! Absolutely, wonderfully gorgeous, Nicole. The colours are just so vibrant. Beautiful stitching.